There had been quite a bit of stir from civil rights leaders about discrimination and segregation in the armed services, and the American Red Cross's refusal to accept blood in donor drives. But in a frontpage article published on February 7, 1942, the Pittsburgh Courier declared, "WE HAVE A STAKE IN THIS FIGHT... WE ARE AMERICANS TOO!" Although quite a few Blacks opposed this viewpoint, the majority were motivated to become more patriotic and support the war. But the newspaper, which served as a voice for the African American community, also encouraged Black soldiers to fight for their equal rights... both abroad and at home. And some of those rights were eventually addressed. 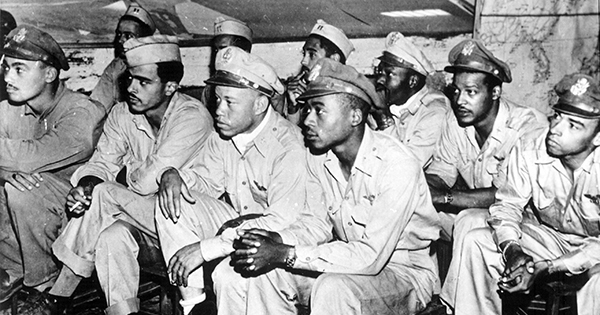 For example, in 1948, just three years after World War II ended, President Harry Truman issued an Executive Order to desegregate the U.S. armed forces.